Discover a life-changing message and reunite the entire Napoli family. "I very much enjoyed playing this game. I like that new entries in the Delicious series always have new game mechanics to play and they don't rehash the same game over and over. It keeps the games feeling fresh, but still within the theme of the Emily games." Discover a message in a bottle that changes Emily's life forever, while cooking divine dishes in Italian kitchens. Now that Paige has fully recovered from her fever, life has settled down again in Snuggford. That is until, the entire Napoli family hears that Emily's missing "Grappa", Vitto, is still alive and might be in Italy. Emily's father, Edward, is overwhelmed by the news. He and his four brothers haven't seen their father, or each other, in years. Reuniting them is going to be quite a challenge. Will Emily succeed in bringing everybody together at the big family dinner? I absolutely love this game! It not only challenges you but it is a family oriented game with no violence. Being able to go to so many different restaurants makes this much more interesting, because each restaurant is so pretty and fun. The Delicious Emily games are my favorite games, and there are times when I get lost with the time and spend hours playing. Thank you for putting out a new game. I've had so much fun playing it and as always, I can't wait for a new one to come out! This is the best one. Glad I bought it! If you like any of the Delicious games, you will really enjoy this one. Have fun! This game is great, story line is good, graphics and music are awesome! I love all the Delicious games, but this one is definitely one of my favorites. Can't wait for the next one! This game is absolutely the greatest. I love all of the Emily games. Have played them all! If you like time management games of any type, then this game is for you. Another great game in the Delicious series. Please keep them coming. They are fun, graphics and music are great. It shows a family saga and I love it. I can only hope that they continue making more games with Emily and her daughter. I really liked the story line and graphics. If you like all the Delicious games, then this one will certainly be a pleasure! I am glad that there is another Emily game to play. I really like the game since she is married and has a little girl. I always like playing the Delicious games! They are fun, challenging, and have a great story line. Please keep them coming! I enjoy the developing story of Emily's life and story and the tastes of fun that come with trials are a tantalizing! Totally looking forward to more! The Delicious games are my favorite of all time. This is well-paced with a fun story line. I've always loved the Delicious Emily games and this one didn't disappoint. The same great graphics - I always love looking for the mouse! Adore upgrading in the shop and changing the menus. I even enjoyed doing my "David Bailey" bit taking photos when prompted. Love it! I love all the Delicious games and I have them all. I am so very glad I bought this game, as it is so much fun! It is a good, clean, wholesome game for the entire family. Just great fun and great challenges. I am so glad GameFools had this game! It is a great game that I could play over and over. I love the way the story line continues from the previous Emily games. I have played all of them. The different scenes and characters are great. I can't wait for the next one. 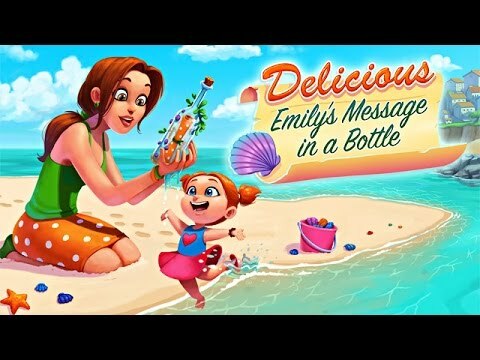 Emily's Message in a Bottle is like the other classics. I enjoyed playing this game. The story is sweet and heart warming. I can't wait to see how it turns out. The graphics, storyline, and game play is wonderful and I enjoyed playing the game tremendously. I loved it. So much fun and excitement, and a lot of challenges. Just the greatest. Fantastic! I can't stop playing the Delicious games, they are so addicting. Watching all the decisions Emily has to make is like family. I love all of these games. I enjoyed the new characters and restaurants. keep making these and I will be happy! Love all of these games and this one included. I love the story line! I thought this was an awesome game. I've played all the other games in the Delicious series. Love it! I love all of Emily's games, and this one is just perfect! And I love that the mouse is bigger. Loved the story. Couldn't stop playing until I finished the story. I just love all of the Delicious series and can't get enough of them. Fabulous pictures. Bring on more please. Oh, love the mouse too! Great fun as the Delicious games always are. I love all of the Delicious Emily games and this one is no exception! I really like the game and that fact that there are so many levels to play. I love the messages in the bottle. I liked the fact that there were more family in this game. It really turns the game around. As I said before I love all of Emily's games. They are exciting to play and the stories are all fun to read.